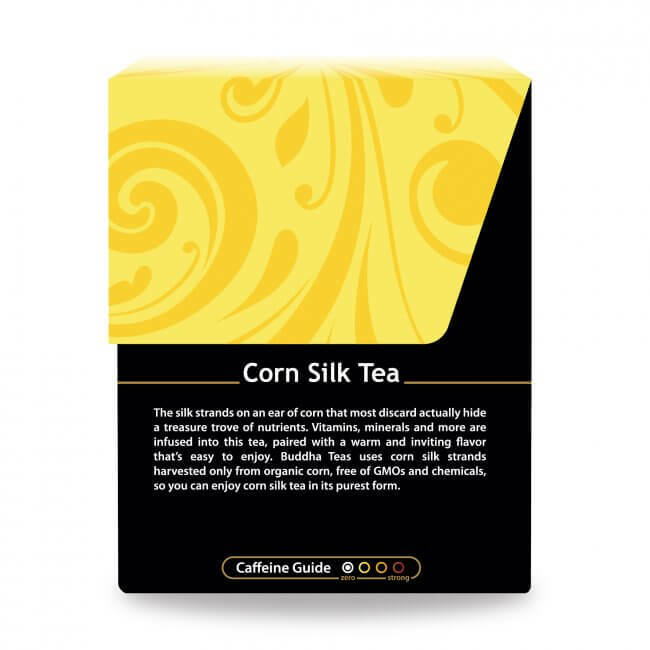 Corn Silk Tea is a truly unique brew, crafted from corn on the cob's silk strands. With a smooth and savory flavor, this tea makes a special addition to any tea collection. If you have any experience with removing the husk from an ear of corn, you're certainly familiar with the long silk strands peeking out from under the husk. Although it may surprise you, these silky tassels, which are often tossed out with the rest of the husk, are actually useful in their own right. 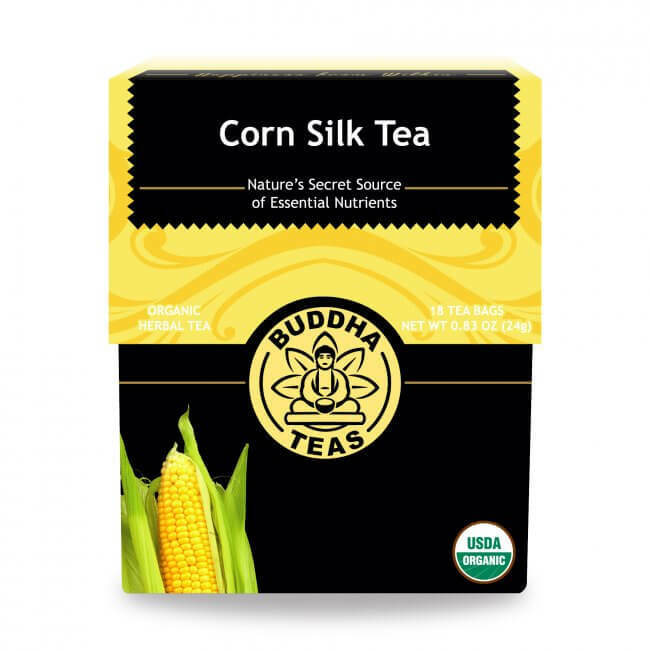 Though it may seem odd that the discarded part of a treat as delicious as corn on the cob actually boasts remarkable healing capabilities, it's true.Buddha Teas Corn Silk Tea is one tea worth exploring. Corn is one of the most significant of the North American grains, and historically a food staple of numerous Native American tribes. However, few people know that these tribes did not only harvest corn to eat the kernels, but they also saved the corn silk, or stigmas to brew as an herbal tea. 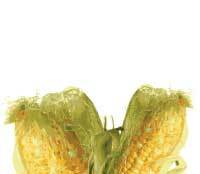 Few people are aware of the remarkable ways that corn's long silks at the tip of the “ear” benefit common ailments. When used medicinally, a fascinating transformation occurs from initial harvesting of the fresh yellow silks. As the crop dries, it becomes curly and brown, before sometimes being made into a powder. What does Corn Silk Tea taste like? 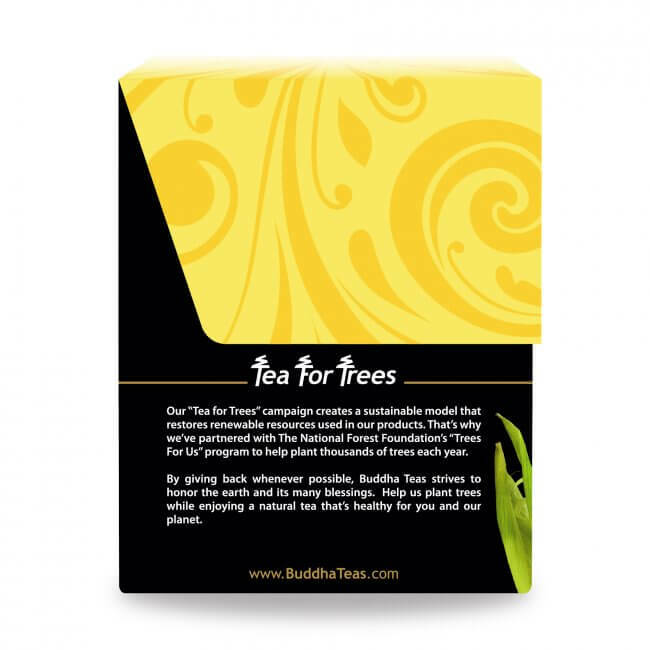 Buddha Teas Corn Silk Tea provides a truly delightful earthy, slightly sweet flavor. It tastes so smooth and nurturing, we are sure that once you delve into this tea, you’re going to want to keep it stocked for daily consumption. A good boil is recommended, and decent steep. Try experimenting with other teas to enhance the benefits, such as: St. John's Wort Tea, and Lemon Balm Tea. With so much of today's produced corn being genetically modified, Buddha Teas goes the extra mile to ensure that our corn silk tea is all certified organic and GMO-free, guaranteeing a refreshing natural tisane for you to delight in. This tea is a wonderful herbal tea option that can be enjoyed at any time of the day. 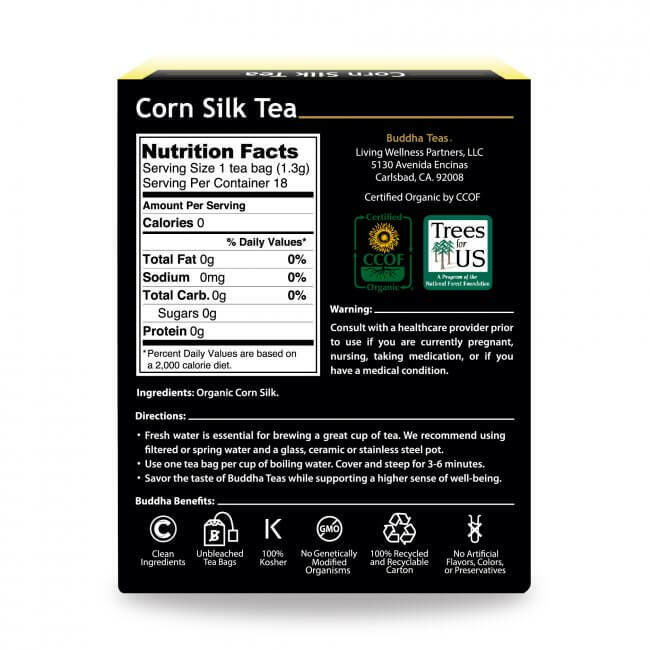 Purchase a box of Corn Silk Tea or stock up and buy in bulk to save on future purchases. Our teas are all natural and packaged in bleach free tea bags and are guaranteed to meet your satisfaction. I’m so glad I tried this tea, as I had developed serious issues with recurrent UTI and BV. I was tired of taking pills and medication, which gave me spotting issues between periods. I was desperately in need of something more natural. After days of searching, I’ve come across this link regarding the benefits of corn silk tea in my emails. So I ordered a box. As soon as I received it, I only drank this tea once and I felt instant results! My spotting is gone! I take it once or twice a day now. The flavour is fine, not too sweet. Thank you so much Buddha tea! This has a smooth mellow taste, not overbearing, or after taste. This tea was recommended for kidney issues. It has definitely helped me. I drink two cups a day. It is soothing and has a mild taste. It also helps with blood sugar issues. I highly recommend this tea. Isa Herrera known for her work in pelvic floor health recommended D-Mannose and/or Corn Silk tea for bladder health and support. I have MS and reoccurring UTI's. I started taking both the D-Mannose and Buddha Corn Silk tea. I figured I wasn't going to have the pain of another UTI by experimenting to see which one worked. After running out of the D-Mannose and where I buy it it's out of stock so I have just had to rely on my Buddha Corn Silk tea for well over a month now and I still haven't had a UTI to date. The best part of all of this is I LOVE how the tea tastes! It is not overly flavorful but yet very calming to drink. I believe I will be drinking my Buddha Corn Silk tea for years to come. I love tea and am looking forward to trying other Buddha teas as well. 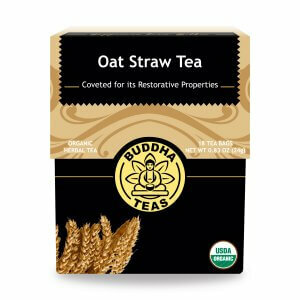 I am certainly a believer in the quality and integrity of Buddha Teas. Love this tea. The taste is great. The packaging is wonderful; makes the experience all the better. I also love this company. This is the first time I am trying the Corn Silk Tea. It taste great I am excited to see the results as I struggle often with UTI's and want a natural solution. I think I have found it! A holistic doctor suggested I purchase this for my dog with TCC it works wonders. I pour it over his food in the morning and the evening and it makes his urine a lot clearer. I have also come to like this tea very much. It tastes great and it’s naturally sweet so not much sugar is needed in my tea. 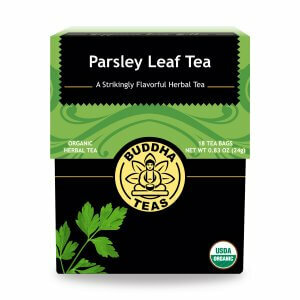 This tea is good for people with urinary problems and kidney stones. Review Title: excellent kidney support and good taste! This was recommended by a friend for swelling in my ankles and feet. It worked after the first cup and I love the taste, too! Another great tea, Thank you! You will benefit by drinking this tea. I believe it helps heal an irritated tract. I ordered the 3 pack, and I will be ordering this tea regularly. You will too -- when you try it!